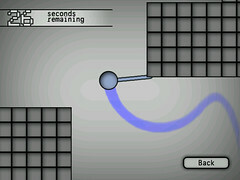 Beredezebe has made ten new levels for Swing Ball and I highly recommend them to everyone playing the game. They are awesome. I actually like them a lot more then the levels I had made. 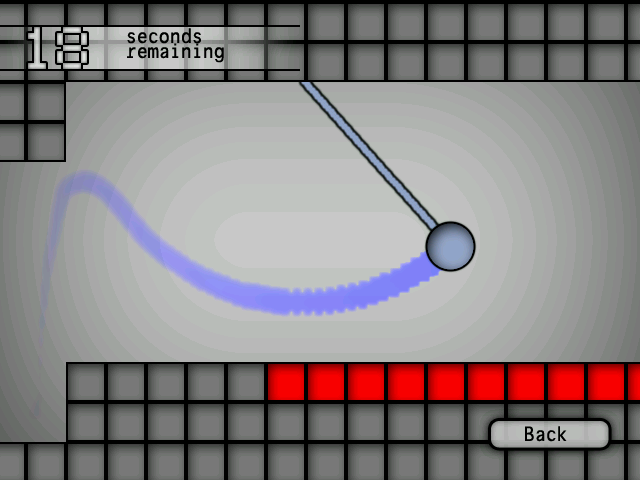 Here is an update for SwingBall. I added a few new levels. Slightly modified a few of the preexisting levels. The level selection screen has been fixed up a little bit. 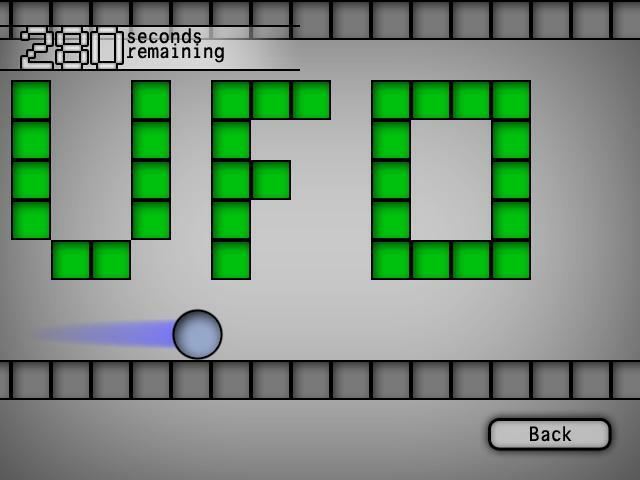 I added a menu screen reminding players that they can make their own levels and explaining how to do it. The frame rate should be moderately better but I’m not actually sure of that. I don’t remember what it averaged at previously and actually seems to me like its worse but I think that must just be in my head. Whats important though is that the frame rate has become purely cosmetic now as your movement speed has been made frame rate independent. Previously you increased your speed and moved at set amounts every time the screen refreshed which meant that you where slower when the frame rate dropped and faster when it increased. Obviously that’s problematic for a game that’s focused around trying to do things in a very exact amount of time. But now your movement speed adapts to the frame rate so it should no longer effect gameplay. There is also a PC version of the game now. The line you swing from is a bit smoother in the PC version and although it depends on your computer it should be fairly safe to assume that the frame rate will be considerably smoother. I’m hoping that the availability of a PC version will also encourage more of you to make your own custom levels. It should be a lot more convenient to do so if you can test, modify and iterate on levels you make without needing to take them back and forth from your computer to your Wii. The prizes (for the uninitiated SwingBall came in second place in the 2010 Nintendomax Wii Dev Competition back at the end of june) from Assentek (a DSi XL and r4i card) arrived today! Yay! I just obviously really want to thank NintendoMax for running the competition and EvilTroopa for forwarding the package after a mix up resulted in them getting both first and second place prizes. Posted on August 11, 2010 Categories Swingball, Uncategorized3 Comments on So Awesome! I wasn’t expecting them to arrive so soon but the Rock Guitar Thunder and Challenger Sports Pack X2 arrived yesterday! 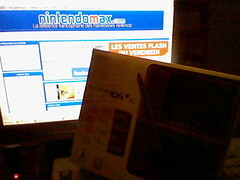 Thanks NintendoMax, Divineo and Assentek! But now what do I do with them? Should I keep them? I remember at some point making fun of plastic Wii controller cases like the ones in the sports pack. But its kinda actually appealing to me now. The guns seem like they might be nice to use. I never got much use out of the official Wiimote sleeves I have but the colored ones included in the pack seem like they might be nice. The baseball bat attachment could even come in handy if I ever feel the need to bludgeon someone to death in the middle of a round of Wii Sports baseball. I also don’t really need another Wii guitar but I suppose I could add it to my pile of video game instruments. The more important question though is what to do with the Wii when it eventually shows up (there is a Nintendo DSi XL + R4i + SDHC and Wii to be shared among first and second place and I’m assuming that EvilTroopa is choosing the DSi XL and related gear). I obviously already have a Wii so I don’t really need it. Whenever I begin working on online games I suppose it might help me for testing purposes to have more then one Wii but really I don’t think I would get much if any use out of it. I know some one that would sorta like it that I could give it to. Or I could be greedy and sell it. If I do sell it then what should the money be spent on? I think I would feel guilty if I didn’t put any money gained from the competition towards something relating to the homebrew scene. It would be somewhat of a cruel joke if the competition resulted in me buying something non productive that consumed all my time and prevented me from creating new games. I don’t have a PSP or DS yet. It would be nice to be able to make games for either of them. Or I could hold onto the hypothetical money and use it to cover part of the cost of a 3DS once they are available and enabled for homebrew. What do you think I should do with my winnings? Along with the results and reviews Cid2Mizard also provided videos of all of the entries (click here to check them all out). So here is another recording of SwingBall. This is actually the only time I’ve ever seen anyone other then myself play the game. Its weird watching someone else play something you’ve made and it definitely helps me understand why some people where bashing the weak momentum or why judges commented on the difficulty and why major dev companies sink so much money into play testing. When your programing and testing a game by yourself then you unavoidably get really close to it and become better at it then you think you are. When I play the game I know where absolutely everything is and exactly how fast I will move and I move forward through the environment with a lot more speed and confidence and without slowing or pausing. Its just interesting watching someone else play it. I just got out of bed (Good luck at trying to guess my time zone. My sleeping schedule is crazy and inconsistent.) and promptly went to check to see if the results had been posted. They had been posted and I am now infinitely happier then I was a few minutes ago. 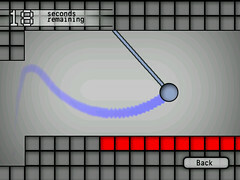 SwingBall has come in second place for the 2010 Nintendomax Wii Dev Competition! 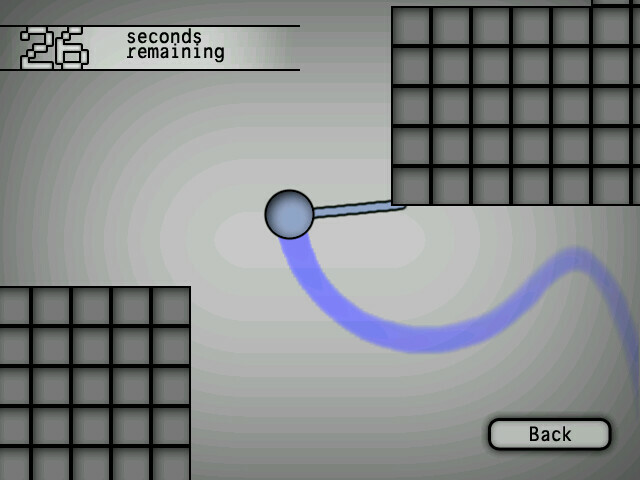 Here is one last update to Swing ball before the deadline for this years Nintendomax Wii dev competition.. Sorry for the videos horrific frame rate. Its actually a video of the game running on a PC and I haven’t been able to find a decent screen recording program aside from fraps (which only works with things using OpenGL and DirectX). I fixed a few little things. Added additional menus and made some improvements to the one menu screen that did already exist. Added a screen pointing out the games use of the nunchuk controller (a commenter on GBAtemp felt that it wasn’t clear enough). Just like the nintendomax splash screen that comes before it you can skip past the nunchuk screen by pressing the A button. There are no real significant changes to the gameplay. I tweaked a few of the levels a little bit. added sound effects. lowered the volume of the music to make the sound effects more audible. I also smoothed out the blue trail that follows you to make it less pixelated. If you make your own levels (all you need to do is make a BMP file and drop it into the levels folder) then I would love to see them. It would be cool to have a pack of community made levels to include the next time I update the game. I got a lot done. There is actually a goal now. There is an onscreen timer that counts down from 30 and if it reaches zero you lose. There are things you can pick up to gain extra time. Your score is equal to how many seconds yo have left when you reach the end of a level. Your high score for each level (there are six at the moment) is automatically saved and gets displayed at the level selection screen. I fixed problems relating to jumping well standing next to something (before standing next to a block would occasionally cause you to either not jump or jump too high). I added the ability to jump well you have a rope out just like you can when you don’t. Now you can control how high you jump by how long you hold down the A button. I generally just tweaked and perfected a bunch of things relating to your movement and collision detection. Instead of there being nothingness outside of the game map now any tiles outside of the level are treated as generic solid blocks. The sprites are still simple and similar to the previous ones but I think they look slightly better now. I also added a blue trailing effect behind your character that blurs and fades nicely.